Specifications are :- 1. Crompton Greaves Motors. 2. Heavy steel body. 3. 4 nos heavy wheels running on ball bearings. 4. Single liver cutting height adjustments. 5. Foldable handle. 6. Grass box steel body. 7. Hardened and Toughned blade. 8. Toolkit. 9. Mcb switches. 10. One Year warranty. •Cutting Height: 0.50" to 4.25"
With rich industry experience & knowledge, we have been able to provide the best array of Wheel Rotary Lawn Mowers. Clipping Bag Volume: 40 Ltr. 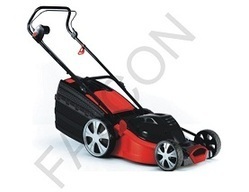 We manufacture and supply GolfKing Lawn Mower used for cutting edge, ideal for maintaining large lawns.It delivers outstanding power, torque and fuel economy, a scratch resistant aluminium deck that will never rust. - High speed Bosch PowerdriveTMmotor. - Enormous rotational power of up to 13 Nm. - Two-stage adjustable handle length. - Lightweight for easy lifting. - Rotary type lawn mowers are suitable for any type of uneven or Plain grass lands available Four free wheel makes the machine to move freely on the Grass and the Adjustments on the Machine helps, you to adjust the height of the Grass as per your Requirements. 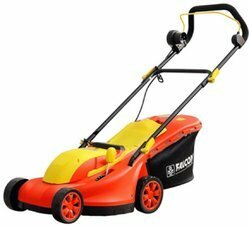 Rotary type lawn mower is very effectively used for commercial places like lawns of clubs.golf courses.palaces and farm houses.it is designed in such a way that it can cut the grass with no time and is also very easy to use. it requires very less of power and is also easy to maintain.